Today, one of my customers notified my of a problem with a website I have created for him. The site uses an Adobe Flash movie to collect data from the visitor and then sends the data (including some raw image data) to a PHP script for further processing. After updating the Adobe Flash Player installation to 10.1, the PHP script would (in some situations) terminate with the error “Call to a member function asXML() on a non-object”. The problem here is that the script uses the PHP parser function “simplexml_load_string” to parse an XML document sent from the Flash movie and then works with the XML DOM object returned by the function. When the string given to “simplexml_load_string” is not a valid XML document, the function will return NULL and this is what happened. So I had to investigate why the Flash movie would suddenly send non-valid XML when it didn’t all the time before. Upon examination I found that the XML code sent by the Flash movie contained &nbsp; entities as they are used in HTML. XML however (while it does know the concept of entities) does by default not know these entities but only a very limited set of entities, so an XML document containing the &nbsp; entity will not be accepted as valid XML. 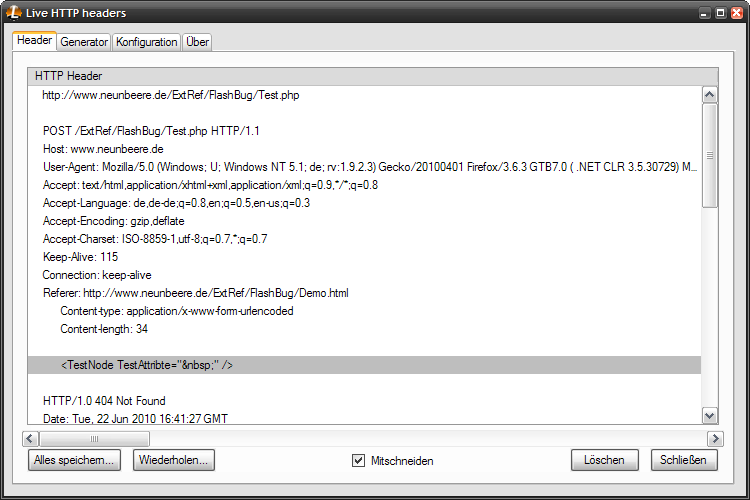 Using the Live HTTP Headers extension of Firefox the problem can be made visible. I have reported this bug to Adobe and it will be interesting to see how quick it will be fixed. 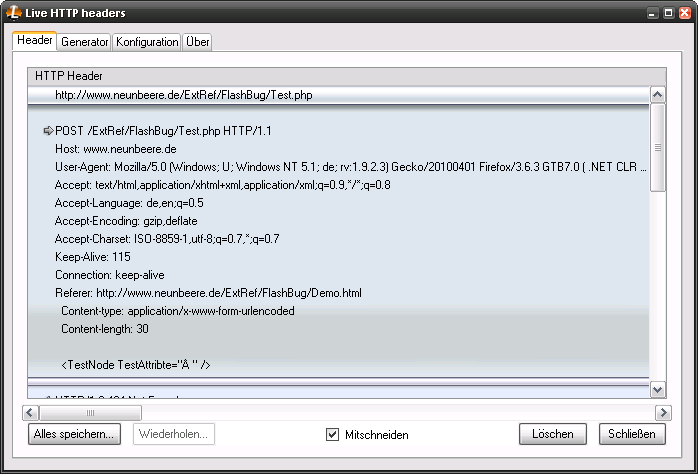 This entry was posted in Programmierung and tagged Adobe, Adobe Flash, Bug, Coding, PHP by NineBerry. Bookmark the permalink. Thanks for posting this. I spent all day troubleshooting this and was elated to find this post. when i try to toggle from low video screen to high video, I get this error in the newest adobe player.